My food blog typically shares recipes, culinary experiments and food musings. I have not been indulging in much cooking lately because I have been eating boring items as I bring my weight and general health back into line. Salad, fresh fruit, lots of water and no more sweets have been the norm. And it’s worked. I’ve shed between ten and fifteen pounds. Now my goal shifts to gaining muscle, strength, endurance and flexibility. I have health issues and I’m not getting younger. So, I started walking, biking, doing 20-minute yoga routines, stretching and doing my physical therapy routines, lifting weights and punching the bag in my garage… Something… Every day. Having a child helps this. When you say, “What are we going to do today?” you get ideas & someone to hold you accountable. I use myfitnesspal to track my calories, mapmyfitness for cute little maps of distance activities, talabata lite to time intervals, freepedometer to track steps during housework & my job and I have a weight lifting one too. But I thought this was getting neurotic of me. So I made myfitnesspal my “homebase,” linked my mapmyfitness and bought a fitbit flex. Yup. A fitbit. After that crazy breakfast and sending my daughter to her grandparents, I suited up with my laptop and my wallet for a morning walk. I planned on stopping at the corner market for sparkling mineral water as a bribe for myself and at the library. I had to head to the library to sync my fitbit as I don’t have internet at home and my iPhone 4 is a dinosaur with no ‘low energy Bluetooth’ capabilities. I headed to the corner store and they didn’t have sparkling water as the neighborhood is more Hispanic than European. I tried coconut water, as coconut water has calcium just like mineral water. I gagged after the first three sips. 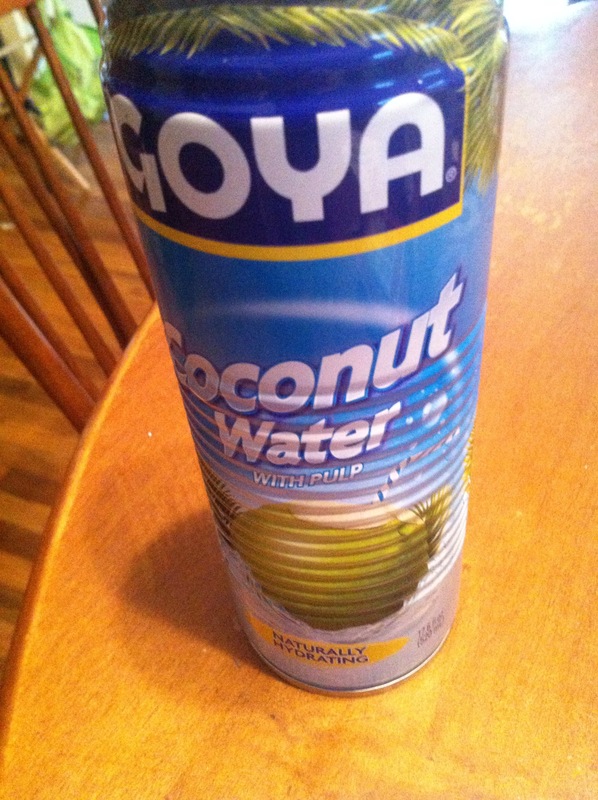 Lightly syrupy yet water with chunks of coconut and sweet yet not… Weird. But I kept walking and got thirsty. Tried another sip. Not appealing but not bad. I continued this every five minutes for a half an hour. Verdict: weirdly refreshing and staved off dehydration. Still don’t like the chunks. Spit them out. Would certainly do it again for something different and not fake like sports drinks. Cannot chug it.